This video was created with ArcGIS Pro 2.2. Data that is spatial in nature is not always stored in a spatial data format. For example, street addresses and latitude-longitude coordinates identify geographic locations but are often stored in spreadsheets, databases, or text files. If you have geographic information stored as a table, ArcGIS Pro can display it on a map and convert it to spatial data. In this tutorial, you'll create spatial data from a table containing the latitude-longitude coordinates of huts in a New Zealand national park. Huts in New Zealand are equivalent to cabins in the United States—they may or may not have sleeping bunks, kitchen facilities, electricity, and running water. The table of hut locations is stored as a comma-separated values (CSV) file. CSV files are a common, nonproprietary file type for tabular data. Your study area is Egmont National Park in the Taranaki region of New Zealand. At the top of the dialog box, in the Search box, type Create points from a table tutorial and press Enter. In the list of search results, click Create points from a table to select the project package. The project opens to the Taranaki region on New Zealand's North Island. 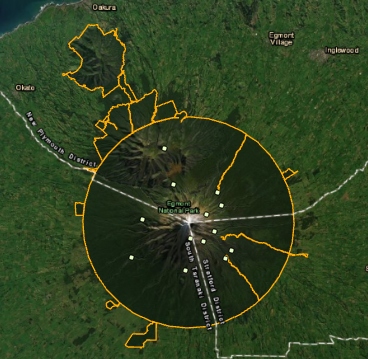 The boundary of Egmont National Park is drawn with an orange outline. Mount Taranaki is in the center of the park. The active view is a 2D map named Egmont. There is also a 3D scene named Egmont 3D. On the Map tab, in the Navigate group, click Bookmarks . Under Egmont Bookmarks, click Egmont National Park to zoom in to the park. The CSV file is stored as an attachment in your project package. You'll add it to the map as a table and convert it to a feature class with a geoprocessing tool. On the Map tab, in the Layer group, click Add Data . On the Add Data dialog box, in the directory, under Project, click Folders. In the browse window, double-click the Create_points_from_a_table_1 > commondata > userdata folders. The userdata folder contains a CSV file and a text file with metadata. 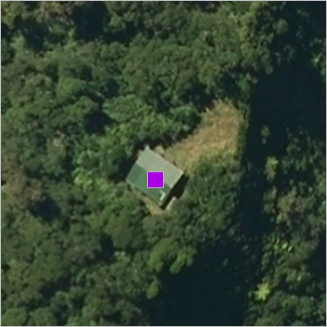 Click Egmont_National_Park_Huts.csv to select it and click OK. The CSV file is added to the Contents pane under Standalone Tables. In a project package, files that can't be stored in a geodatabase, such as shapefiles, CSV files, and text files, are included as attachments. 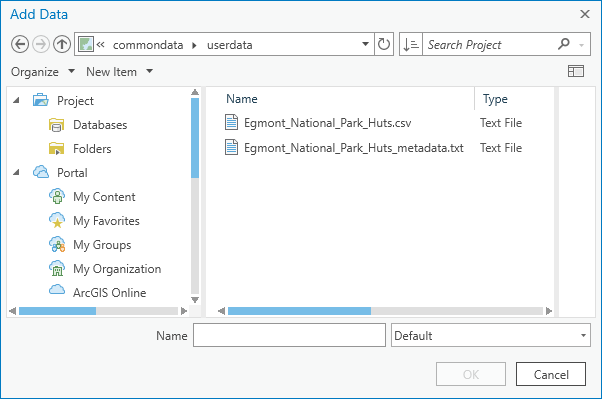 Within the project package folder structure, attachments are stored in the commondata > userdata folder. In the Contents pane, right-click Egmont_National_Park_Huts.csv and click Open . The table's attributes include the name and type of hut, the number of people it accommodates, and its latitude-longitude coordinates in decimal degrees. Latitude-longitude coordinates, or some other set of x,y coordinate system values, are needed to create a feature class from a table. In the Contents pane, right-click Egmont_National_Park_Huts.csv and click Display XY Data . The XY Table to Point tool opens in the Geoprocessing pane. The Input Table parameter is correctly set to the CSV file. Change the Output Feature Class name to ENP_Lodgings. ENP stands for Egmont National Park. If necessary, set the X Field to LONGITUDE and the Y Field to LATITUDE. Leave the Z Field empty because the table doesn't contain elevation values for the huts. The Coordinate System is set to GCS_WGS_1984. This coordinate system is used by default because it is a common one for latitude-longitude values, not because it is known to be correct for the input table. In fact, it is the correct coordinate system, but you would need to look at the CSV file metadata to confirm this. Although the coordinate system is correctly set for the input table, you want the output feature class to use the same local coordinate system used by the rest of your New Zealand data. You'll make a geoprocessing environment setting to project the output data to a different coordinate system. At the top of the Geoprocessing pane, click the Environments tab. Click the Output Coordinate System drop-down arrow and click Current Map [Egmont]. The Output Coordinate System setting changes to NZGD 2000 New Zealand Transverse Mercator, the local coordinate system used by the map. When you run the tool, the output data will automatically be projected to the NZGD 2000 New Zealand Transverse Mercator system. The color of your point symbols may be different. When the tool finishes, a new feature class is created in the project geodatabase. A layer named ENP_Lodgings, representing the hut locations, is added to the map. In the Catalog pane, browse to Databases > create_points_from_a_table.gdb to see the new feature class. You'll add an item description to the new feature class. An item description includes a summary and description of the data as well as tags to make the data searchable. In the Catalog pane, right-click the ENP_Lodgings feature class and click Edit Metadata . 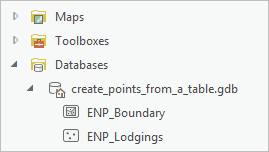 A metadata view opens for the ENP_Lodgings feature class. In the Contents pane, the elements of the metadata style are displayed. If you're using the default Item Description metadata style, the only element listed in the Contents pane is Item Description. The metadata element is currently invalid because required information is missing. If you're using a different metadata style, you'll see other metadata elements as well. Item Description is the only element you need to edit in this tutorial. 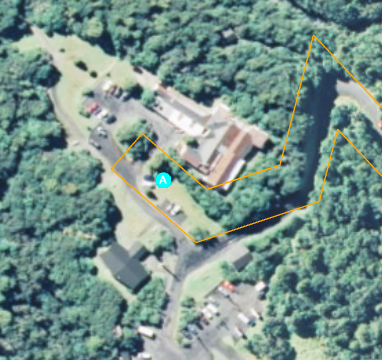 In the metadata view, in the Tags box, type (or copy and paste) the following keywords: cabins, hotels, huts, Egmont National Park, Taranaki, New Zealand. Make sure the keywords are separated by commas. In the Summary (Purpose) box, add the following text: Locations of huts, lodges, and hotels in Egmont National Park for planning hiking and ski trips. Click in the Description (Abstract) box. 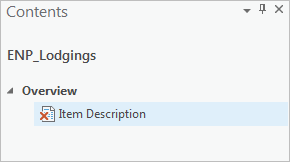 In the Contents pane, the Item Description element is now marked valid because the required information is present. In the Description (Abstract) box, add the following text: Features were created from a CSV file with latitude-longitude coordinates and projected to NZTM. The source coordinates were derived from measurements made by Peter Scott. Peter Scott’s data was published on May 13, 2015 and is shared under a Creative Commons Attribution 3.0 New Zealand license. Peter Scott’s dataset is more accurate than this dataset. 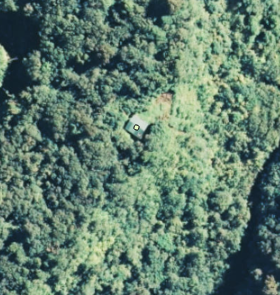 For more information, see the online dataset Egmont National Park - Huts, accessible at https://koordinates.com. Additional features in this dataset were digitized on the Esri World Imagery basemap. In the Credits box, add the following text: Peter Scott (peter@zoneblue.org); koordinates.com. Under Credits, click New Use Limitation. In the Use Limitation box, add the following text: Creative Commons Attribution 3.0 New Zealand. If spell-checking is enabled on the settings page (as it is by default), unrecognized words are marked with wavy underlines. See Proofing options for information on spell-checking. On the ribbon, on the Metadata tab, in the Manage Metadata group, click Save . Close the ENP_Lodgings metadata view. You'll zoom in on a couple of features in the ENP_Lodgings layer to make sure they are actually located on buildings. You'll also change the layer's name. On the Egmont map, zoom in close on any point feature. Optionally examine one or two other features. In the Contents pane, right-click the ENP_Lodgings layer and click Properties . On the Layer Properties dialog box, on the General tab, change the layer name to Lodgings. Click the Source tab. Scroll down and expand Spatial Reference. The layer's coordinate system is NZGD 2000 New Zealand Transverse Mercator as you specified in the tool environment settings. Click OK on the Layer Properties dialog box. The layer name is updated in the Contents pane. On the ribbon, click the Map tab if necessary. In the Navigate group, click Bookmarks . Under Egmont Bookmarks, click Egmont National Park. You'll set a visibility range for the layer so the huts don't display at small scales. You'll also set scale-based sizing for the layer so the symbols get larger as you zoom in. Finally, you'll choose a symbol that shows up well on the imagery basemap. Make sure that the 2D Egmont map is the active view (not the Egmont 3D scene). In the Contents pane, click the Lodgings layer to select it if necessary. On the ribbon, under Feature Layer, click the Appearance tab. In the Visibility Range group, click the drop-down arrow next to Out Beyond and click 1:500,000. If 1:500,000 is not in the drop-down list, type the value directly into the input box or choose a different value. In the Contents pane, click the symbol for the Lodgings layer. The Symbology pane displays options to format point symbols. At the top of the pane, click the Gallery tab if necessary. 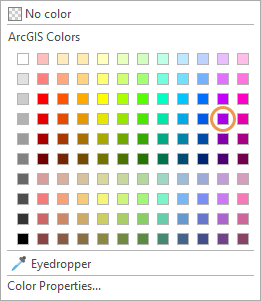 In the scrolling box of symbols, under ArcGIS 2D, click Square 1. Click the Properties tab and confirm that the Symbol tab is selected under it. 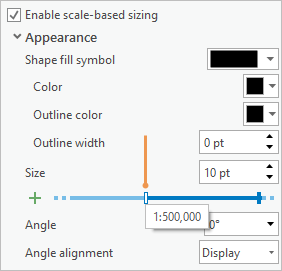 Check the Enable scale-based sizing box. A slider appears under the Size property. It has two size stops (short vertical bars) that represent the minimum and maximum map scales for which symbol sizes can be set. Hover over the leftmost size stop. The first stop is set at 1:500,000. This is the smallest scale at which the layer is visible because of your visibility range setting. Hover over the other size stop. This stop is set at 1:1,000, the largest scale to which you can assign a symbol size. You can zoom in closer than 1:1,000 on the map, but the symbol size won't increase. The second stop is currently selected (blue). Above the slider, the size value for the selected stop is 10 pt. Change the Size to 12 pt. This will be the maximum size of your symbol. Click the first size stop to select it. The size value for this stop is currently 10 pt. Change the Size to 2 pt. When the map scale is 1:500,000, the Lodgings symbol will be 2 points in size. As you zoom in, the symbol size will gradually increase until it reaches a maximum size of 12 points. At the top of the pane, click the Layers tab . Under Appearance, change the Color to Anemone Violet. Change the Outline color to Gray 30%. Change the Outline width to 1.5 pt and press Enter. Click Apply. At the current map scale, the symbol outline may not be noticeable. In ArcGIS Pro, thin lines are simulated with transparency when anti-aliasing is turned on (as it is by default). If you need to see a thin line, such as a symbol outline, at all scales, you can turn off anti-aliasing. See Set display options for more information. Click the Map tab. In the Navigate group, click Bookmarks . Under Egmont Bookmarks, click Taranaki Region. The map zooms out to a regional scale and the Lodgings layer should not display. In the map scale box in the lower left corner of the map view, click the drop-down arrow and click 1:500,000. The layer displays and the features appear at their minimum size. Zoom in gradually and notice that the symbol size increases. Go to the Egmont National Park bookmark. The Lodgings layer has 13 features: 10 huts that belong to the Department of Conservation and 3 that belong to alpine clubs. In addition, there are 2 resort hotels inside the park that aren't in the CSV file. In this section, you'll locate the first of these hotels, Dawson Falls Mountain Lodge, and add it to the layer. On the ribbon, on the Map tab, in the Inquiry group, click Locate . In the Locate pane, click the Settings tab. Confirm that the ArcGIS World Geocoding Service is included in the list of locate providers and that it is enabled. A locate provider finds map locations from text descriptions or spatial coordinates. Your list should include XY provider and ArcGIS World Geocoding Service. If you are signed in to ArcGIS Pro through an ArcGIS Enterprise portal, you may have a different locate provider that you can use to complete this section. If not, skip ahead to the View the layer in the 3D scene section. In the Locate pane, click the Locate tab. The website for Dawson Falls Mountain Lodge describes the lodge as being at the end of Manaia Road in Egmont National Park. It doesn't provide a street address. In the Locate pane, in the search box, type Manaia Road. Do not press Enter. You must type the address—not copy and paste it—to see the list of suggestions described in the next step. In the drop-down list of suggestions, under ArcGIS World Geocoding Service, click Manaia Rd, Egmont National Park, 4391, NZL. The map zooms in and a marker is placed at the end of Manaia Road. The complex of white buildings with brown rooftops next to the road is Dawson Falls Mountain Lodge. On the ribbon, click the Edit tab. In the Features group, click Create . In the Create Features pane, expand Lodgings, if necessary, and click the Lodgings feature template. The feature template of the Lodgings layer is selected. The template specifies the default symbol for new features (the purple square with a gray outline) and the default tool for creating features (the Point tool). 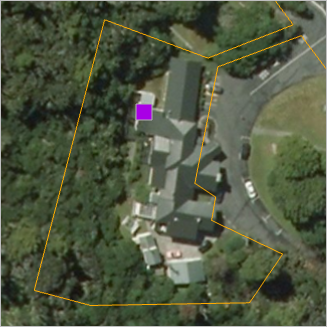 Both the Lodgings layer and the Egmont National Park layer are editable. You can control which layers are available for editing on the List By Editing tab of the Contents pane. On the map, hover over Dawson Falls Mountain Lodge and click to create a point feature. The feature is created and selected. Now you'll add attribute values for the feature. On the ribbon, on the Edit tab, in the Selection group, click Attributes . In the Attributes pane, with the Attributes tab selected in the middle of the pane, click next to NAME and type Dawson Falls Mountain Lodge. Press Tab. For TYPE, type Hotel and press Tab. For CAPACITY, type 24. Click Apply. You can leave <Null> values in the LATITUDE and LONGITUDE fields. On the Edit tab, in the Selection group, click Clear . The second resort hotel in the park is the Stratford Mountain House. It's located on Pembroke Road but not at a well-defined part of the road. You'll locate it by its latitude-longitude coordinates. In the Locate pane, in the search box, clear the current expression. Type 174.12248, -39.306201 and press Enter. 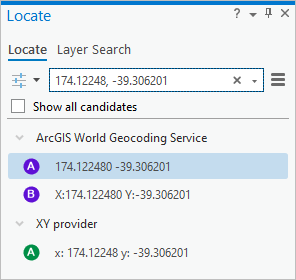 Results found by both the XY provider and the ArcGIS World Geocoding Service appear in the Locate pane. The map zooms to the hotel's location and a marker is added. In the Locate pane, right-click the first result under ArcGIS World Geocoding Service (designated by an A marker) and click Add To Feature Class . A point feature is added to the map at the marker location. The new feature is under the marker, so you may not be able to see it. In the Locate pane, clear the search box. The marker disappears and you can see the new feature for Stratford Mountain House. It's not selected. In the Attributes pane, click Select one or more features . On the map, click the point symbol for the hotel to select it. In the Attributes pane, replace the coordinates in the NAME field with Stratford Mountain House and press Tab. For TYPE, type Hotel and press Tab. For CAPACITY, type 22 and click Apply. On the ribbon, on the Edit tab, in the Selection group, click Clear . In the Manage Edits group, click Save . On the Save Edits prompt, click Yes. In the Contents pane, right-click the Lodgings layer and click Attribute Table . Scroll to the bottom of the table. The table should have 15 records, including records for the 2 features you just created. On the ribbon, click the Map tab and go to the Egmont National Park bookmark. You can display 2D layers in 3D scenes. The scene's elevation surface will automatically position the 2D features in a 3D landscape. In the Contents pane, right-click the Lodgings layer and click Copy . Make the Egmont 3D local scene active by clicking its view tab. In the scene's Contents pane, right-click Egmont 3D and click Paste . Use the mouse buttons and mouse wheel to zoom, pan, tilt, and rotate the scene. Alternatively, use the on-screen navigator in the lower left corner of the scene. The features display in their correct locations on the 3D surface, but the symbols lie flat—like bits of paper stuck to the mountain. In the Contents pane, drag the Lodgings layer from the 2D Layers category to the 3D Layers category. The layer now uses 3D drawing properties and the symbols stand up on the surface. This effect is called billboarding. This is an improvement, but a symbol designed for 3D viewing will look better. In the Symbology pane, under Format Point Symbol, click the Gallery tab if necessary. In the search box, type cube and press Enter. 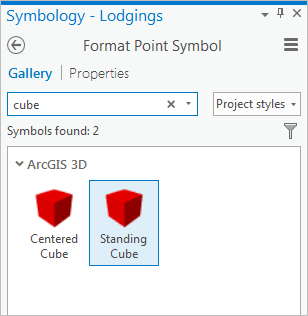 In the list of symbols, under ArcGIS 3D, click Standing Cube. You can access more symbols by adding styles. See Add styles to a project for more information. Click the Properties tab. Click the Symbol tab under it if necessary. Click the Color drop-down arrow and choose a color that you like. Change the Size setting to 5 pt and click Apply. Scale-based sizing is not available in scenes. For this scene, a 4- or 5-point symbol size works well at most scales but may be too small or too large at some scales. Continue to explore the scene using navigation tools and Egmont 3D Bookmarks. A tabular dataset, such as a Microsoft Excel file or a CSV file, can be converted to spatial data in ArcGIS Pro as long as the table includes street addresses or spatial coordinates. This makes it possible to visualize and spatially analyze a wide variety of data—from customer lists to tables scraped from websites—that is spatial in nature but not yet spatially enabled.